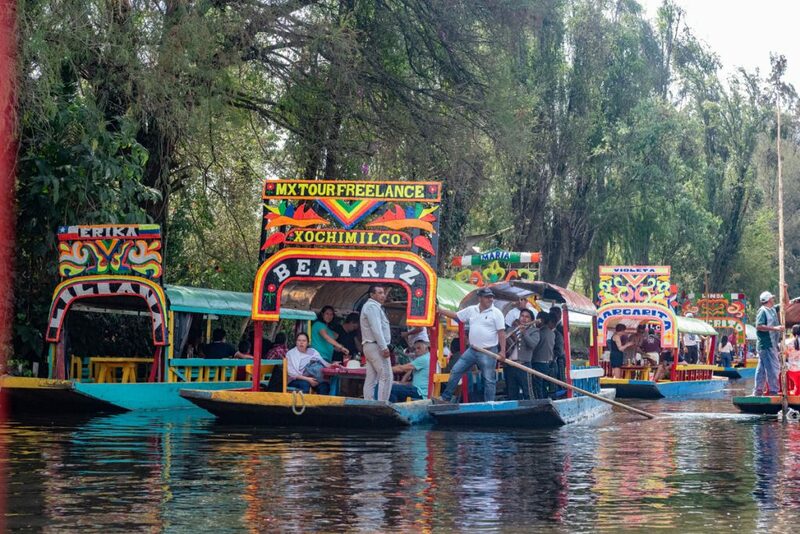 Xochimilco - an unmissable Mexican experience - WattWhereHow? 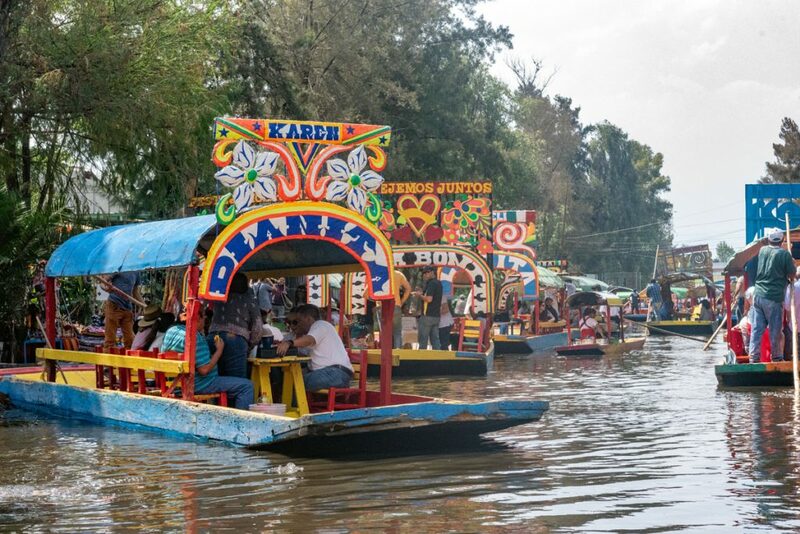 Xochimilco, Mexico City’s floating market of colorful gondola-like boats has been on enough travel documentaries to risk being a tourist trap. Instead, it was a refreshing window into Mexican family life and culture. 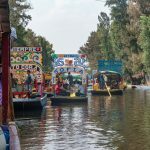 Xochimilco is actually so much more than the canals and islands you may have seen on blogs and travel shows. It’s one of the city’s 16 boroughs, a sprawling green belt to the southwest set on what was once Lake Xochimilco. Back when the Mayans first settled in Mexico City, the region was a wetland of rivers and man made islets called chinampas. The islets were created to grow crops where there wasn’t actually land, built up on matted reeds, tied to partially submerged trees. Over time, the islands would sink and be replaced, the shallow lake gradually being overtaken by resumed land. In between, canals offered a way to connect and transport the produce. In all there are over 170km of canals weaving through the region and this connection to the city’s roots has ensured it is now protected as a world heritage site. Today, you can hire one of the colorful Trajineras – gondola-like vessels ably steered and propelled by locals, negotiating the narrow canals with long staffs. Each trajinera is personalized, with bright paints, decorations, and differentiated with the name of a girl. We catch an uber directly to the Embacardo. 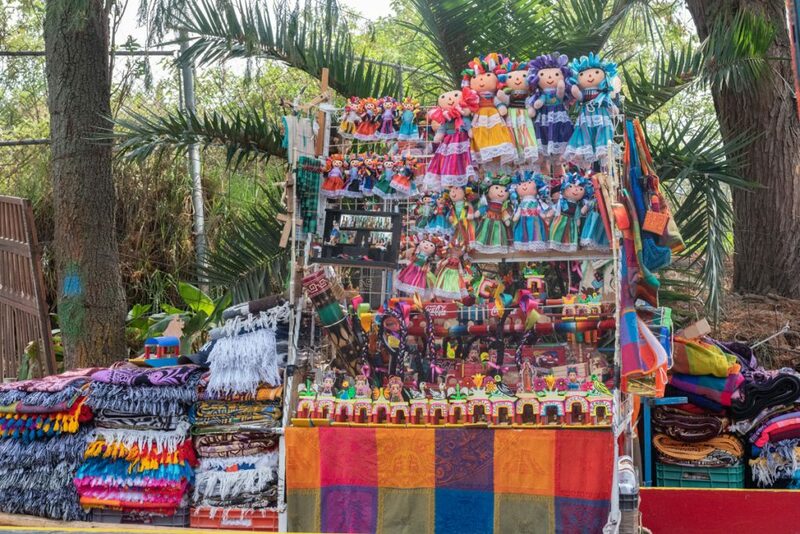 The forecourt marketplace is doing a bustling trade in folk art, dolls, hats and musical instruments. 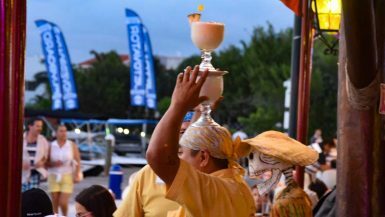 Fresh coconuts are sliced open for a replenishing drink and locals are clutching big gulp cups of beer encrusted with chili and salt rims – the michelada, a combination best described as a Bloody Mary margarita with beer poured on top. 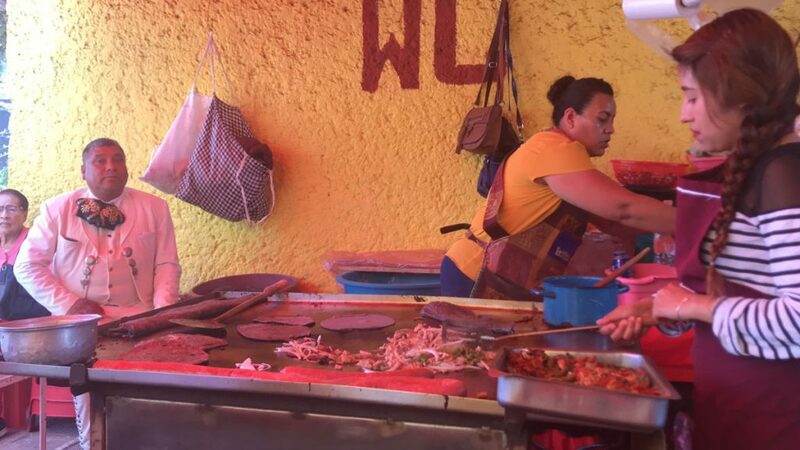 Temporary tents provide basic shelter for Vendors selling freshly cooked tacos. 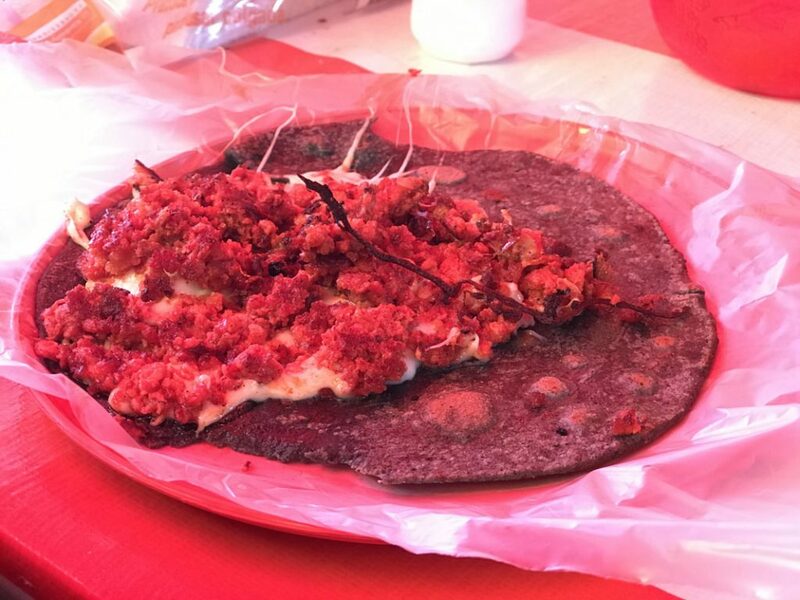 Rather than the traditional small corn tortillas, local women concoct blue corn tacos on a wok-like iron cooking surface. They work the ingredients furiously, carving up chicken thighs into a minced consistency and folding in onions, peppers and fresh chili. Bordering this griddle is a Plethora of hot sauces. The finished product is flattened bread that can easily feed two people. It is sliced in half and served with slices of lime. 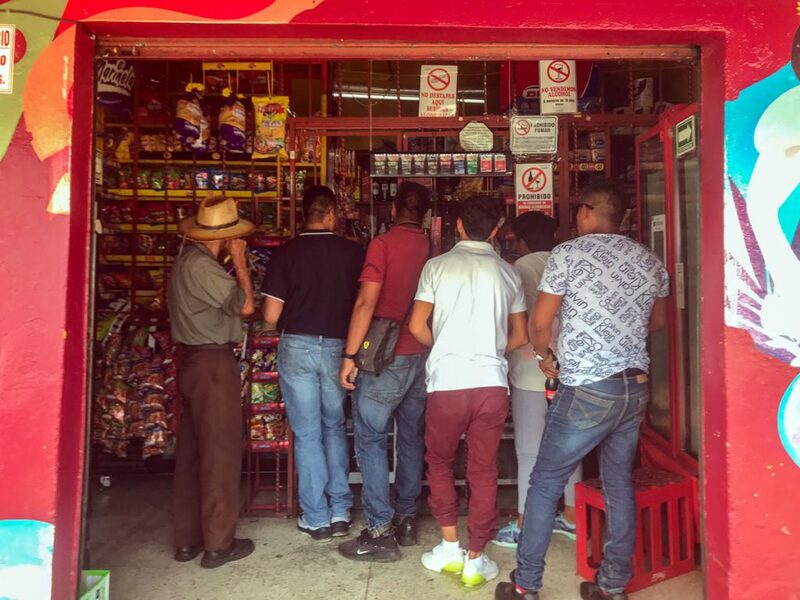 Sunday is still considered a holiday in Mexico City, a place that has defied the downward trend in Catholic Church attendance in light of years of eye opening instances of child abuse. Here families dress up to go to church then gather for a large lunch with all the family, with the Abuela cooking traditional favorites. 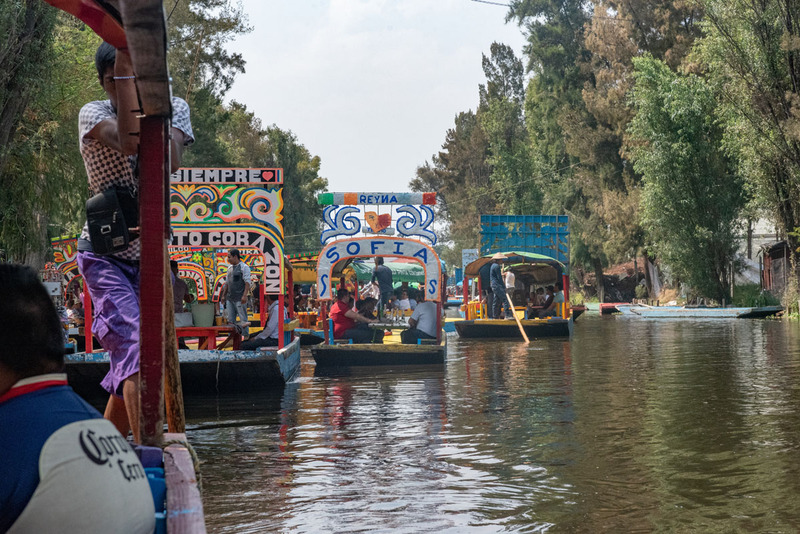 At Xochimilco on a Sunday, we’re greeted with large families holding parties and lunches on the bright colored boats. There’s an atmosphere of total celebration and relaxation amidst the mayhem and explosion of colors of the trajineras trying to load and unload passengers at the point of embarkation. 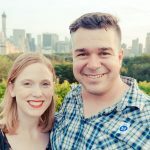 Homes and businesses around the area profit of the basic human needs of a bathroom, snacks and beers that all should be tended to before boarding. You’ll find cleanish toilets well signposted for 50 pesos while a queue of men at one of the many shacks denote where to buy alcohol from. Before boarding, you will be accosted by several hustling boat owners. It is with them that you need to negotiate your time and price. The going rate is 400 pesos an hour for two hours, though we only had an hour given the rather ambitious to-do list to get through in three days. You pay your fee in cash to this man but be aware that once on the boat, you will then be responsible for a secondary fee, a tip that is paid to the two staff on board. The boats are simply furnished, with two long trestle tables and wood seating that goes the length of both sides of the boat. Once you’ve pushed away from the muddy shoreline you’ll be instantly swept up in a euphoric feeling of celebration. Every boat is colorfully decorated and filled with families and revelers. Some have brought their own karaoke machines and are massacring Mexican classics; there are dogs, kids and dancing grandparents. Boats frequently collide and smaller two-person merchant launches squeeze in between selling trinkets and wooden models of the colorful boats. 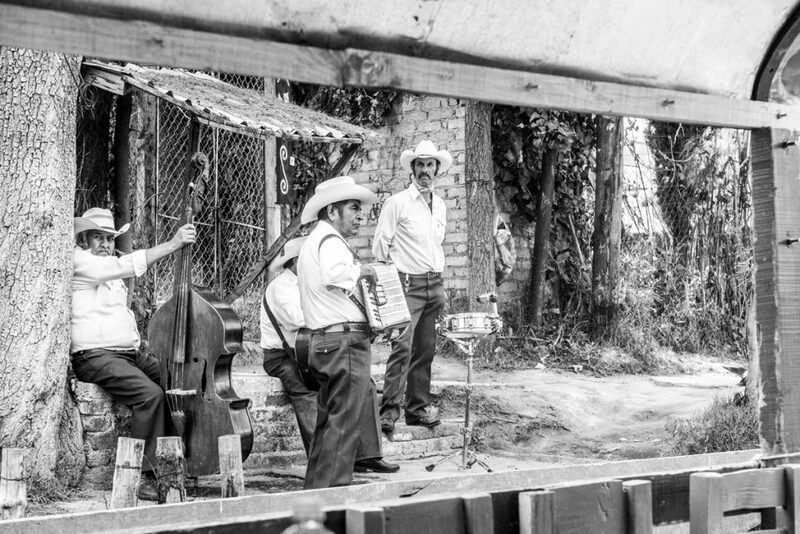 Mariachi bands step aboard for private shows for a fee or you can be escorted by boats of older gentlemen playing xylophones – it’s all very random and rowdy. 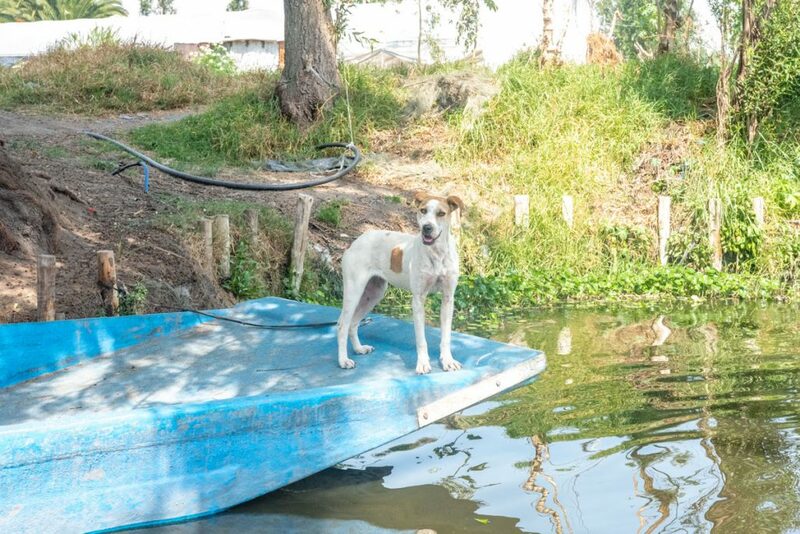 There are boats servicing the canals with cold beers and Micheladas but no liquor or you have the option of stopping at one of the bars and bathrooms that enterprising locals have built on their canal side allotments. You’ll see locals lazing in the sun on the banks, people cycling with their dogs and picnickers. We only had an hour rather that the standard two to explore the canals and missed the famous Isle of the Dolls, a haunting islet where locals hang dolls in memory of children lost too early. 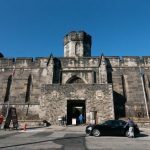 Easily a highlight to our time here, we would definitely come again to see that. 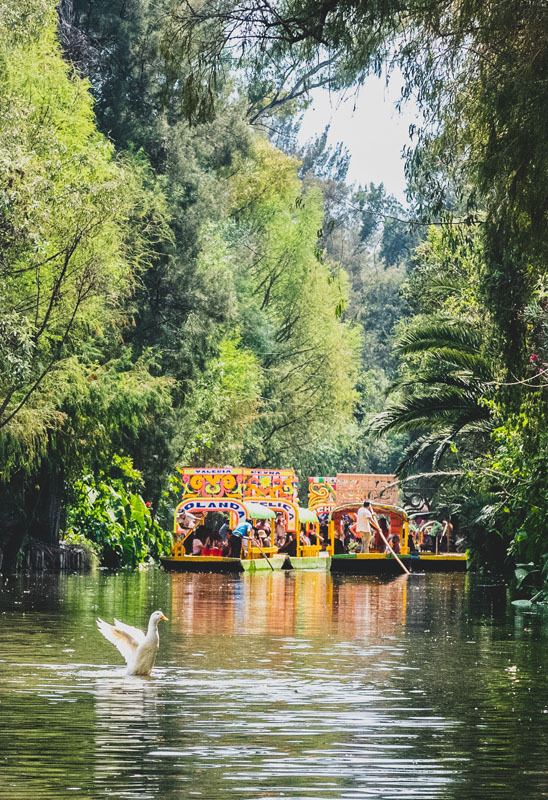 Xochimilco is a celebration of Mexican life in all its Technicolor glory, an unmissable day out – especially if you can time your visit for a Sunday. Xochimilco is a borough of Mexico City where you will find canals and estates of gardens, parks and pathways. While there are trains to Xochimilco we preferred an uber which only cost $20 for the over 45 minute trip from the historical center. Most boats offer a 2-hour trip for around 400-500 pesos for an hour. You then will need to pay a tip of another 300 pesos on the boat to the crew. 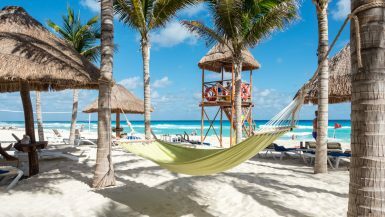 Be wary of being overcharged as a gringo, and prepare the Google Translate app to aid your negotiations. Thank you, John. We’ve been a little quiet post-trip and work has been super heavy atm. It was a pleasant day and well worth going just to see families having the time of their lives. Well look at that! 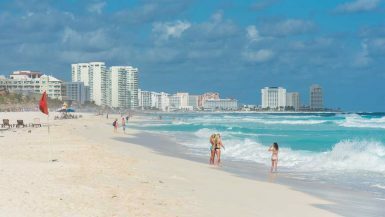 I had no idea there was such a thing in Mexico!